Nokia Here collection vehicles v2.0 are now being deployed in 27 countries across five continents, so the next time you see one roaming around your neighborhood, you’ll know exactly what’s happening inside. Nokia Here collection vehicles v2.0 all starts with a VW Jetta TDI wagon or Subaru Forester / Crosstrek. The former is attractive for its fuel economy, the latter for its AWD drivetrain and ground clearance. Unlike the first generation equipment — which required modifications to the roof plus the installation of a wheel sensor and cabinet full of gear — v2.0 uses a common Thule roof rack and a single ruggedized case. As such, it only takes two people about 30 minutes to convert a car (like a rental, for example) into a collection vehicle. The collapsible mast includes (from top to bottom) a NovAtel GPS antenna, Velodyne HDL-32E LIDAR sensor, four 16.2-megapixel cameras each with 180-degree field-of-view and a NovAtel SPAN-CPT inertial measurement unit. A skid prevents any low-hanging cables from catching the GPS antenna and LIDAR sensor. The new imaging system provides much higher resolution, color fidelity and dynamic range than before. The signal from these sensors is routed to a ruggedized case that fits in the passenger footwell and connects to the car battery. It contains an x86-based computer running Linux, 1TB 3.5-inch removable SATA hard drive and 12V backup battery. A Nokia Lumia 920 and Microsoft Surface Pro (mounted on a stand bolted to the seat rails) complete the package — the former is powered by a standard USB car charger, the latter by the aforementioned box. The phone acts as an LTE hotspot / in-vehicle WiFi network for the tablet and the Linux computer. Special software developed in-house (called Route PhD) is installed on the Surface Pro to control the x86 system. The driver receives a route over LTE and the software gives them spoken navigation instructions for an efficient route that minimizes overlap (there’s typically about 30% redundancy on purpose). After turning the data collection on, they simply follow the navigation instructions to complete the entire route. When the hard drive is almost full, the software notifies the driver who drops it off with FedEx or UPS. The LTE connection is also used for status updates and fleet tracking. Nokia Here collection vehicles aren’t the only way the Finnish giant is gathering data about our highways and city streets. The company’s researchers are also using anonymous smartphone, PND and even CAN bus data to further our understanding of traffic flow and driver behavior in different conditions. 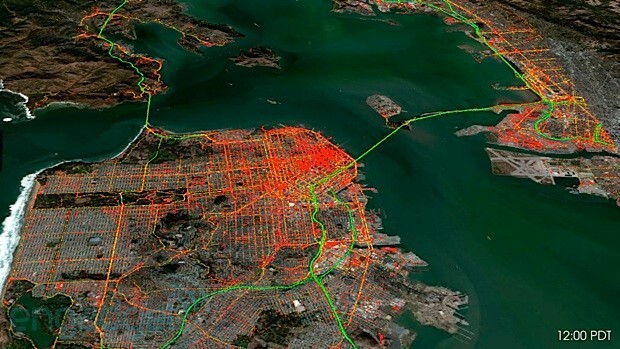 Beyond improving maps and navigation, the goal is to make our roads better and cars smarter. 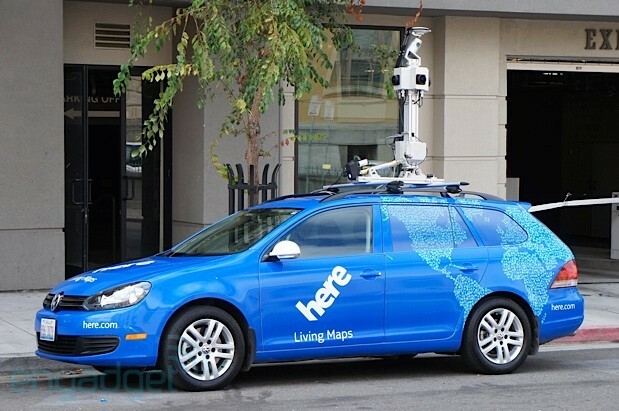 They recently spoke with Nokia’s Jane Macfarlane, Head of Research for Here, who shared how her team is bringing map data to life with the collaboration of opt-in smartphone users and fleet vehicle operators. Take a look at the pic below and watch the video after the break. Macfarlane showed us a video of traffic flow in the Bay Area — San Francisco and Oakland, including the Bay Bridge, Golden Gate Bridge, Interstate 80, highways One and 101 — over a 24-hour period. With colors representing different vehicle speeds (green for fast, yellow for medium and red for slow) it’s easy to visualize how the traffic changes during the day and when / where hotspots exists. This data gives city and highway planners invaluable insight into ways to improve our roads. According to Macfarlane, one of the biggest challenges with this research is getting access to data in real-time without invading people’s privacy — it’s something she’s optimistic will improve as telematics become more widespread on modern cars and drivers gain more control over how CAN bus data is gathered.